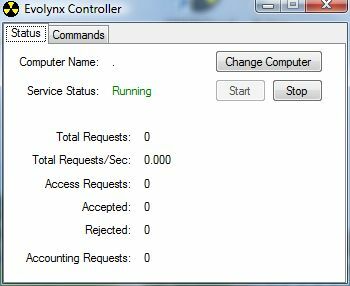 Configuration of the RADIUS Server is done by the Evolynx Controller tool. This tool is a Windows program which allows you to check and control status of the RADIUS Server, and also provides a user interface to modify the configuration settings. These settings are different from data managed by the Web Admin, because these settings are stored in an XML configuration file named settings.xml. All data managed by Web Admin are stored in the SQL Server database. Evolynx Controller tool can be executed by clicking on its icon in the Start menu, or by directly executing the program from Windows Explorer or command line. The Status tab shows current status of the RADIUS Service and some Performance counters. It also lets you Start or Stop the service. 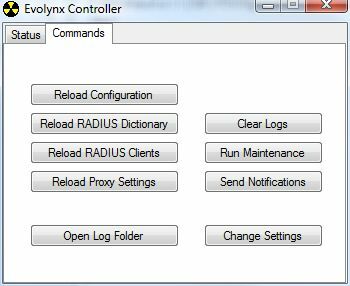 Commands tab gives you more detailed control on how Evolynx RADIUS works. Reload Configuration: Reloads the configuration file settings.xml and applies the changes. Reload RADIUS Dictionary: Reloads the dictionary file radius.txt and applies the changes. Reload RADIUS Clients: Reloads the Clients from API or from file clients.txt and applies the changes. Reload Proxy settings: Reloads the proxy settings from file proxy.txt and applies the changes. Clear Logs: Clears the current Log file stored in the Logs folder and truncates the Log table in database. Run Maintenance: Manually forces the Maintenance operations to be executed. Maintenance operations are normally executed on specific time intervals. Send Notifications: Manually forces the email Notifications to be sent. Notifications are normally sent on specific time of day. Open Log Folder: Opens a Windows Explorer to location of Log files. This is handy when you are troubleshooting, because very useful information can be found in the log file. Change Settings: Opens the Settings window, which lets you modify the Configuration Settings.